On the one hand, the trailer for "What's Your Number?" brings to mind the kind of wretched romcom tripe that typically stars Katherine Heigl or Kate Hudson. But on the other hand it stars Anna Faris. Faris' new film is about a young women who learns that 96% of women who've slept with 20 or more men never get married. After doing some quick accounting, she realizes that she's one short of her limit, and so decides to catch up on all her past conquests in the hopes that one of them is Mr Right. Apparently women who've slept with 19 men have a really good chance of getting married. 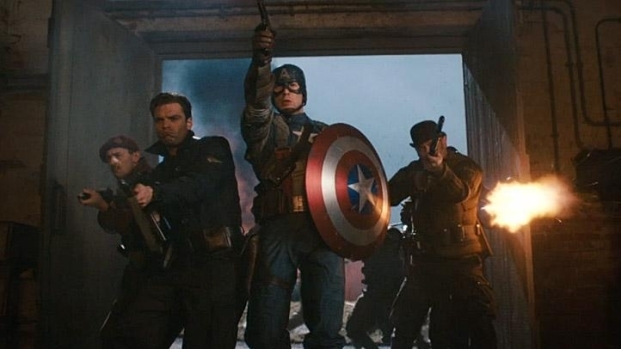 Chris Evans stars as the super solider who takes on Red Skull (Hugo Weaving) and the Third Reich. Opens July 22. The cast of men in her past is impressive: real-life hubbie Chris Pratt, Anthony Mackie, Martin Freeman, Andy Samberg, Zachary Quinto, Joel McHale... But if the trailer's any guide, smart money is on her ending up with Chris "Captain America" Evans. We love Faris--though not as much as Tad Friend--and so we're gonna try to separated this in our minds from "entertainments" like "27 Dresses," and give her the benefit of the doubt that "What's Your Number?" will have a little more brains and heart. The film comes out Sept. 30. And if you're wondering, Faris claims her number is 5.